David has been commissioned to undertake many restoration and repair projects and recent work has been the total reconstruction of an Adam Hermanos, and restoration of an 1824 Gennaro Fabricatore and an 1840 Luis Panormo. David carries out any restoration work needed on the guitars in the Granary-Guitars Collection. Gennaro was a very important maker of stringed instruments. He worked in Naples from 1773-1832, making all manner of stringed instruments, including violins and cellos. 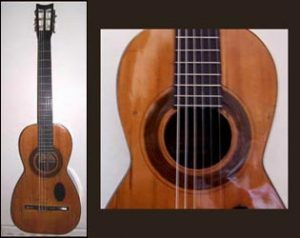 There are examples of Gennaro’s guitars in museums in Stuttgart, Buenos Aires and Rome. This guitar was very dirty and some work was needed on the pegs and fretboard. It is now a playable instrument, and much of its former glory has been restored. Panormo was the son of an Italian luthier and was born in Paris in 1784. He moved to London in 1819 and set up shop in Bloomsbury, where he built a variety of stringed instruments including guitars. 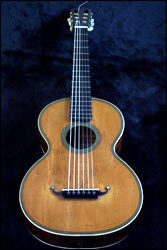 As his label states: Louis Panormo was`The only maker of Guitars in the Spanish style’. His guitars, together with the Spaniard Josef Page’s, were important in development of the guitar. They included fan strutting, which allowed a thinner top to be used with higher tension strings without the table breaking under the strain. David had the project of restoring one of these guitars, and because the struts had been removed in previous poor repair work, he had to take off the back and re-strut the guitar. This particular guitar had an extra strut on the treble side. Sons of the famed French maker, Francois Roudhloff, of Mirecourt, they moved to London in the early 19th Century and made quality guitars. Crafting a new rosette on a 19th Century Sentchordi (Spain). This Panormo type instrument has now been fuly restored and sounds great. 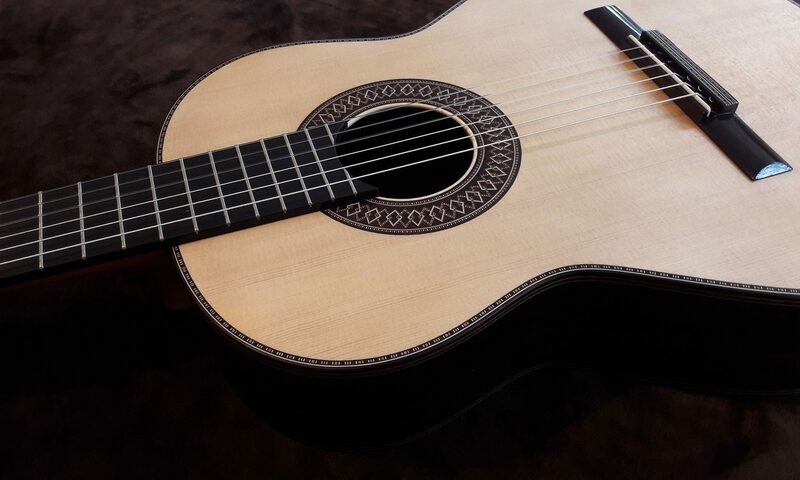 Any restoration or repair work on guitars of any age would be considered, and pricing would be on an individual basis after inspecting the work required. De Lorca was one of the first to endorse the fan strutting system. He followed closely the work of Pages and Claro. David constructed a new bridge to the original dimensions and design and the guitar can now be played as it was at the turn of the 19th Century. These early 19th Century guitars are from The Mirecourt School in France, Aubry Maire (right) and Derazey (left) are perhaps better known for their violins which are in great demand. I was honoured to restore the guitars of two very fine makers. 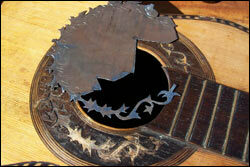 Crafting a new rosette on a 19th Century Sentchordi guitar (Spain). Manuel Sentchordi was born in Valencia in Spain in about 1700. 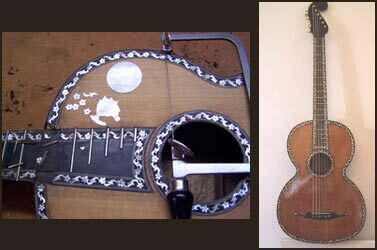 Restoring the mother-of-pearl decoration on a Luigi Filano guitar. Filano was from a mandolin and guitar manufacturing family. He worked actively in the early 1800s and was thought to have been closely associated with Gennaro Fabricatore.